This Math Series Puzzle will test your Brain. In this Brain Testing Math Puzzle you are given one number series and your challenge is to find the next two numbers in this series. It looks easy when you read first few numbers. However when you try to get the last few numbers it will look tough. Lets see if you can crack this Brain Testing Math Puzzle? Can you solve this Brain Testing Math Puzzle? 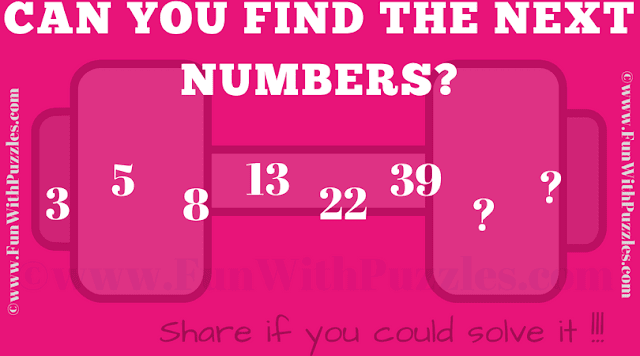 Answer of this "Brain Testing Math Puzzle", can be viewed by clicking on answer button. Please do give your best try before looking at the answer.